Through the years, Trane has designed and developed the most complete line of Packaged Rooftop products available in the market today. Trane was the first to introduce the Micro — microelectronic unit controls — and has continued to improve and revolutionize this design concept. The ReliaTel™ control platform offers the same great features and functionality as the original Micro, with additional benefits for greater application flexibility. Trane Voyager delivers a product that provides exceptional reliability, meets stringent performance requirements and is competitively priced. Trane Voyager features cutting edge technologies: reliable compressors, computer-aided run testing, and Integrated Comfort™ Systems. Trane rooftop units and systems are unitary systems manufactured in various configurations providing single or multi-zone heating, cooling, and ventilation. From our 17.5 SEER Precedent to our IntelliPak with CDQ (Cool, Dry, Quiet dehumidification system), Trane rooftop units technology represent the industry standard in meeting commercial building comfort needs.All of our commercial rooftop units and systems, from 1½ tons through 162 tons, are designed to address today’s comfort demands, superior indoor air quality, straightforward installation and minimized energy consumption. Dedicated digital controls enable the use of building management systems to allow for efficient operation and system monitoring to ensure performance to design.Innovative technology and an impressive lineup of features make the Trane IntelliPak Rooftop line the number one choice for today and the future.The Trane rooftop Unit Control Module (UCM), an innovative, modular microprocessor control design, coordinates the actions of the IntelliPak rooftop in an efficient manner and allows for stand-alone operation of the unit. Access to the rooftop unit controls, via a Human Interface Panel, provides a high degree of control, superior monitoring capability, and unmatched diagnostic information.Optionally, for centralized building control on-site, or from a remote location, IntelliPak can be configured for direct communication with a Trane Tracer™ building management system or a 3rd party LonTalk or BACnet building management system, using a twisted pair of wires. With a Trane rooftop unit, the IntelliPak status data and control adjustment features can be conveniently monitored from a central location. IntelliPak has the technology and flexibility to bring total comfort to every building space with industry-leading efficiency and low cost of ownership.Built on the legacy of the Trane industry leading IntelliPak, the IntelliPak II 90 to 162 ton platform is designed for the future. Expanded features and benefits, controls enhancements and world class energy efficiencies make the IntelliPak II the right choice for demanding applications today and tomorrow.The Trane rooftop Unit Control Module (UCM), an innovative, modular microprocessor control design, coordinates the actions of the IntelliPak II Rooftop for reliable and efficient operation and allows for standalone operation of the unit. Access to the unit controls, via a Human Interface Panel, provides a high degree of control, superior monitoring capability, and unmatched diagnostic information.Optionally, for centralized building control on-site, or from a remote location, IntelliPak II can be configured for direct communication with a Trane Tracer™ or a 3rd party building management system using Lon Talk or BAC net. With any of these systems, the IntelliPak II operating status data and control adjustment features can be conveniently monitored from a central location. At 17.5 SEER, this ENERGY STAR rated Precedent is one of the most energy-efficient packaged rooftop units in the industry. It is up to 17 percent more efficient than the competition and exceeds federal minimum requirements by over 30 percent. Improved energy efficiency translates directly to reduced energy cost.The Precedent 17 Plus rooftop unit is available with an enhanced indoor fan cycle and variable capacity compressor capabilities. This includes a factory-installed and programmed Electronically Commutated Motor (ECM) that varies system supply airflow for superior humidity control, comfort, energy efficiency and sound levels at part load conditions. It also provides higher efficiency and significant cost savings during continuous fan operation.Trane combines technological innovation with legendary durability and performance to create the lowest cost of ownership. 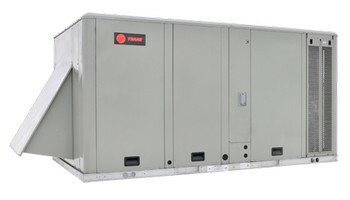 Trane® Precedent rooftop units not only offer the lowest installed cost, they also can reduce utility bills and maintenance requirements to create the lowest total cost of ownership in units that can operate at peak performance for as long as 20 to 30 years,Through the years, Trane has designed and developed the most complete line of Packaged Rooftop products available in the market today. Trane was the first to introduce the Micro — microelectronic unit controls — and has continued to improve and revolutionize this design concept. The ReliaTel control platform offers the same great features and functionality as the original Micro, with additional benefits for greater application flexibility .Trane Voyager delivers a product that provides exceptional reliability, meets stringent performance requirements and is competitively priced. Trane Voyager features cutting edge technologies: reliable compressors, computer-aided run testing, and Integrated Comfort Systems.